Berjumpa kembali dengan kumpulan event-event serta lomba-lomba terbaru dari blog lomba.co, nah dikesempatan kali ini kembali admin membagikan sebuah event/lomba yang dipersembahkan oleh FTI-ITS Surabaya berjudul Indonesia Chemical Engineering Car Competition setelah sebelumnya sudah juga admin share Indonesia Chemical Engineering Paper Competition serta National Olympiad of Chemical Engineering. ICECC 2017 ini merupakan ajang event/lomba yang patut untuk diikuti oleh kalian semua para mahasiswa/mahasiswi karena semua peserta dari kalangan apapun seperti chemical, engineering, chemistry dan lain-lain dapat mempersembahkan hasil karyanya. Chemical Engineering Innovation Festival proudly presents Indonesia Chem-E-Car Competition 2017! The biggest annual Chem-E-Car competition encourages every undergraduate students and further study to pour their innovative ideas. One of the biggest Chem-E-Car Competition worldwide consist of Poster Presentation, Race Day, also the glamorous Gala Dinner. Prepare your team now and win the total prize of IDR 34 Millions! Be ready for the registration which started on January 1st, 2017. Indonesia Chem-E-Car Competition is one of the biggest annual competition of performing a car which using chemical reactions as the main source of power. The car will be given an amount of weight and have to stop in a given distance. ICECC is the creative media for finding an innovative power source for every chemical engineers and related fields around the world. 1. Open registration and job safety analysis on January 01 - February 19, 2017 (Free Payment). 2. Concept revision on January 01 - March 05, 2017. 3. Finalist Announcement on March 12, 2017. 4. Poster presentation on April 21, 2017. 5. Race competition on April 22, 2017. 6. Gala dinner on April 23, 2017. Bertempat di: Institut Teknologi Sepuluh Nopember Surabaya, Indonesia. 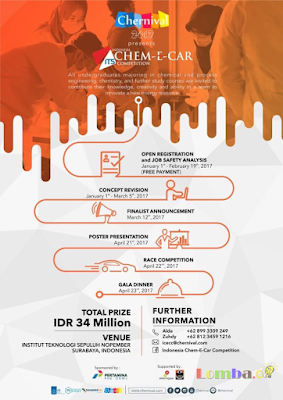 Belum ada Komentar untuk "Lomba Indonesia Chemical Engineering Car Competition (ICECC) 20176"